Nick Hurst was working in a London advertising agency when he decided to quit his job and set off, as you do, for Malaysia to train with a legendary kung fu master. After four years spent under the tutelage of one Quek Chong Tze – or as we shall always now know him, Sugong – Hurst, unsurprisingly perhaps, thought about writing a book. But it would not be just about his own experiences – although his training was often brutal as his mentor pushed him to the limits of physical and mental toughness – so much as about Sugong himself. Because Hurst had uncovered the astonishing story of a man who trained under a drug-fuelled master and, before his 16th birthday, was nearly killed in a family feud. And that was almost an aside compared to what happened next. 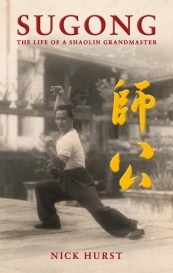 The result is Sugong: The Life Of A Shaolin Grandmaster, a rip-roaring adventure yarn – except that it is all true – that kept this reader up until the small hours, such is Hurst’s easy style and his ability to tell such a remarkable story. As it turned out, Hurst at once found the interviews heavy going. His first question was about his subject’s parents. The answer was succinct: “You want to know about my parents? Go ask them and stop bothering me.” As Sugong was nearing 80 and his parents were presumably long-dead, Hurst took this as a “no”. Or more probably as a “sod off”. But he persisted and, thanks in no small part to the patience of a translator who came in for as many, probably more, verbal onslaughts that the author himself, the full story was finally wrung out of a belligerent old man. Born in a peasant village in the political turmoil of 1920s China, Sugong was a troublesome and a troubled child. But also, as most rebels are, a bright one. And when he came across the imposing figure of Lao Ping Sun, a travelling martial arts performer who arrived in Sugong’s village, he saw a way to become such a performer himself. As Hurst explains, there is a Chinese saying that behind every mountain there is a higher one; meaning that humility should always be maintained because, no matter how great your own ability, there is always someone bigger, faster, stronger. Becoming a martial arts performer is the way to find out who that is. More important for Sugong, it was probably the only way he was going to survive. How to pay Lao Ping Sun for tuition was a question soon answered when the seven-year-old Sugong discovered that the man he wanted as his first master was a drug addict. So the young lad began to shave off a little of the opium that belonged to an uncle. When the boy was 11, the uncle, shrewder and wilier than Sugong’s father, got him into school. But formal education ended two years later when a teacher confiscated a pen given to Sugong by the uncle – it was the only pen in the school – and the boy retrieved it, but only after a fight. And so the tale unfolds: Sugong flees conscription into the Chinese army, but is drawn into a violent world of gangs and blood-brother cults in Singapore. Saved by a Shaolin warrior monk, his penance is eight years’ brutal temple training. There is a near-fatal falling out with his master, steamy love affairs, race riots and gangland vendettas as Sugong witnesses war-torn China in the 1930s, post-war instability in Singapore, racial tension in newly independent Malaysia, and mob rule in Taiwan after the Chinese breakaway. This is a fascinating book – part biography, part social history, part memoir as Hurst’s own relationship with Sugong is explored. The author is now back in London, working in advertising again. Considering that his own life to date has seen him work as a teacher of English, money-broker, model, marketing man and stuntman, and that he was once offered work as a priest in Japan, he probably has another book in him. Mon Apr 16: SJA Spring Golf Day, Surbiton GC. Click here for booking details. Thu Apr 19: SJA Annual General Meeting, Fleet Street, 12.30pm. Click here for details. Thu May 10: SJA Ladbrokes Lunch with former England cricket captain Alec Stewart. Booking details to be announced.